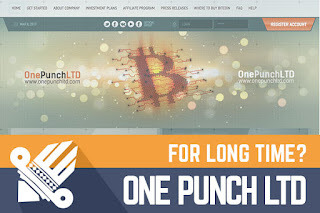 DavidNews HYIP blog - News & Reviews: One Punch LTD - For long time? One Punch LTD - For long time? One Punch LTD and I reinvested $400 into this project. This is not a fresh project, but today it is online around 80 days. The thing that it is online this long makes me believe that project can perform well also in the future, but as you know in this industry, we can't know anything for sure. More in the review. When we take a look at One Punch LTD project turns out that it is attractive project, but of course, at the same time, it is very standardized. If you are wondering if being standardized is good or bad I would say more good than bad because it makes the project easy to understand for every, even most inexperienced investor. Of course, we can debate here about previously used design, but if something has worked in the past, it should also work in the future. The project has a quite communicable owner and seems that he also operates on most popular social networks. As we know then social networks have tremendous power if the administrator knows how to take advantage of them. On the Facebook profile, we can find that administrator had some fight with some monitor, but it is nice to see that administrator well explained actual situation. The project also have dedicated phone number, but sadly I was not able to reach administration, but it was possible that they were not working at that time. In any case, there is not that much what I can say about this project because as I said it is standardized and quite straightforward. One Punch LTD offers two investment plans, and I would like to say that I like investment plan that pays 6% daily on every business day for 30 days. While it seems that interest it quite big total return is just 132% and that is very reasonable amount to maintain the stability of this project. As you heard there is another investment plan, this second one pays 113% return after ten calendar days, but as you know because of risk if I would invest now, I would choose a plan that pays 6% anyway. In conclusion, I would like to say that project works well despite simple looks. Of course, I'm no Nostradamus, and I can't predict how long this project will last, but I would not be surprised that it would last for several investment cycles. In any case - only time will show that and invest only with caution. And only that you can afford to lose. Investment plans: 113% after 10 calendar days, initial deposit included in the payment. 6% daily for 30 business days, initial deposit included in the payments. Join One Punch LTD Here! You need to remember that the best Bitcoin exchange company is YoBit.